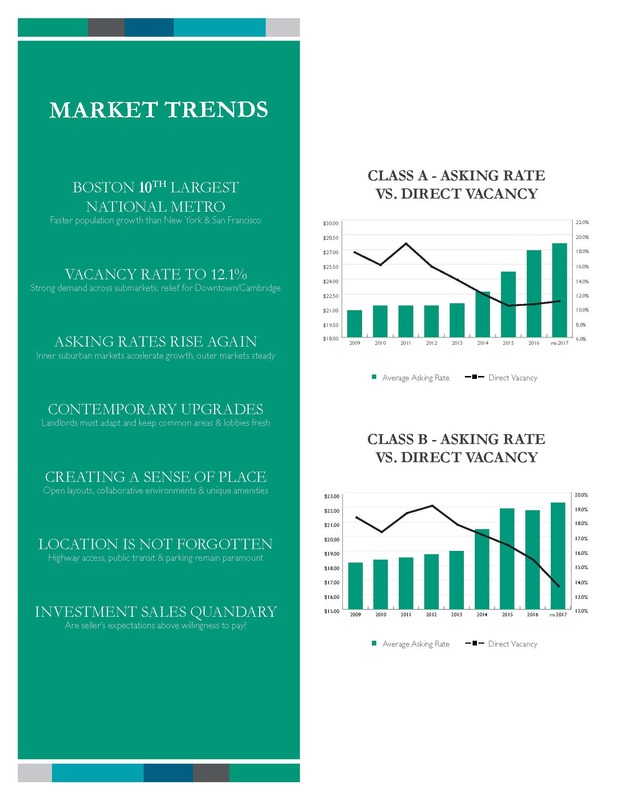 Rents across Greater Boston have steadily risen and vacancy rates have declined for years now. The explosive growth of the Life Science and maker space sectors has created a large block scarcity and tenants are frequently being pushed further into I-495 locations. From the tenant’s perspective occupancy costs can be 2-3x lower along I-495 and landlords are enhancing buildings by creating vibrant amenity centers often by converting rentable office space into gyms, food service, game rooms and conference facilities. In many cases we are seeing back-office operations heading back to the suburbs while executive and recruitment teams maintain city locations. Looking forward expect more bifurcation as companies keep occupancy costs in-check without sacrificing certain strategic corporation decisions. The investment sales market along I-495 also saw a very strong start to 2019 with multiple noteworthy sales. Calare Properties acquired 30 Speen Street in Framingham, a 40,500 square foot office building, for $3.3 million. NeoSome Life Sciences, a firm that provides support research for drug discovery, bought 5 Fortune Drive in Billerica for $2.55 million, a 30,000 square foot flex building. IPG Photonics picked up another building in Marlborough acquiring 225 Cedar Hill Street, a 107,520 square foot Class A office building, for $21 million. Additionally, EMD Serono announced plans to expand their Billerica research and development complex with a new $70 million, 145,000 square foot office and lab complex that is scheduled to open in 2021. Sprawling corporate owned suburban campuses continued being offered for sale and/or leaseback. With an estimated 13 corporate campuses over 500,000 SF surrounding the city, unlocking the availability of these campuses for 3rd party office, R&D and other uses will likely be a continued market driver in the near term. Typically institutionally constructed and located in highly accessible locations, corporate campuses offer strong repositioning opportunities and in many cases also serve as covered land plays.